The Indianapolis Colts have signed former Panthers wide receiver Devin Funchess to a one-year deal worth (at maximum) $13 million. It’s an incentive-laden deal for the veteran, who had a poor walk year with the Panthers. If he reaches that max value, that would make him the 15th-highest-paid wide receiver in the league next season. To me, it seems like Indianapolis might have overpaid. Throughout his four-year NFL career, Funchess has averaged one drop per every 8.0 catchable targets. Among all 92 wide receivers to see at least 150 targets over that span, that ranks fourth-worst. On 311 career targets, Funchess sports a 7.42 yards per target average, which ranks 13th-worst of 92 qualifying wide receivers. Last season, rookie WR D.J. Moore totaled 232 more receiving yards than Funchess on one fewer target. 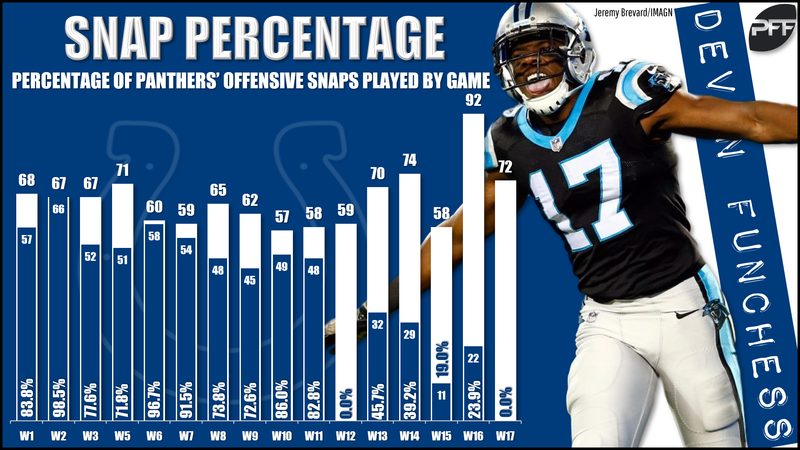 Funchess was a healthy scratch last year in Week 17, after seeing his playing time dwindle to just 32% of the snaps over the previous four weeks. Things were certainly brighter for Funchess at one point, when he hit 50 receiving yards or more 14 times over a 21-game span. That said, he hit 50 yards just five other times across 40 career games. Okay, so Indianapolis definitely overpaid, but for fantasy, that’s probably a good thing. It shows the team thought highly of him, has a clear vision for how fits into this offense, and now, they literally have a lot invested in him panning out. By all measures, this was a pretty ideal landing spot for Funchess. Indianapolis attempted 40.2 pass attempts per game in 2018, which ranked second-most. Based on his salary alone, Funchess should immediately leapfrog any of Chester Rogers, Ryan Grant, Zach Pascal, Dontrelle Inman, or Deon Cain for immediate starting WR2 duties. Indianapolis used their wide receivers in a three- or sometimes four-way committee after Hilton, but Funchess should be a full-time player for the Colts next year, and there’s clearly plenty of targets to go around. Though Funchess was glaringly inefficient at racking up yardage throughout his career, he was a fairly efficient touchdown scorer. Since entering the league, Funchess ranks 21st among wide receivers in touchdowns (21) and 20th in touchdowns per target. That sort of touchdown-dependency is typically a red flag, but we’ve seen it work before with other Indianapolis receivers. TE Eric Ebron just finished second among receivers in touchdowns (13), despite ranking 41st in yards (750). WR Donte Moncrief ranked 38th in fantasy points per game from 2015 to 2016 on the back of good touchdown efficiency despite poor yardage efficiency. As it stands, I see Funchess as a lesser talent in a great situation. I’ll have him ranked as a low-range WR4 in PPR leagues, and slightly higher in standard leagues.